We take pains here at Christmas Designers to be sure we're always providing honest, practical answers to your questions. Unfortunately, I can't say the same for some of the other Christmas light sellers out there. And this is perhaps the most hyped-up topic I've ever encountered in our industry. It's quite common for consumers to be given outrageously misleading answers to this question. 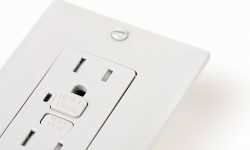 Just the other day, I read a blog article posted by one of our competitors. 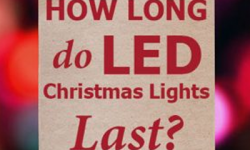 The topic of that post is the very topic of this post: How long LED Christmas lights last. 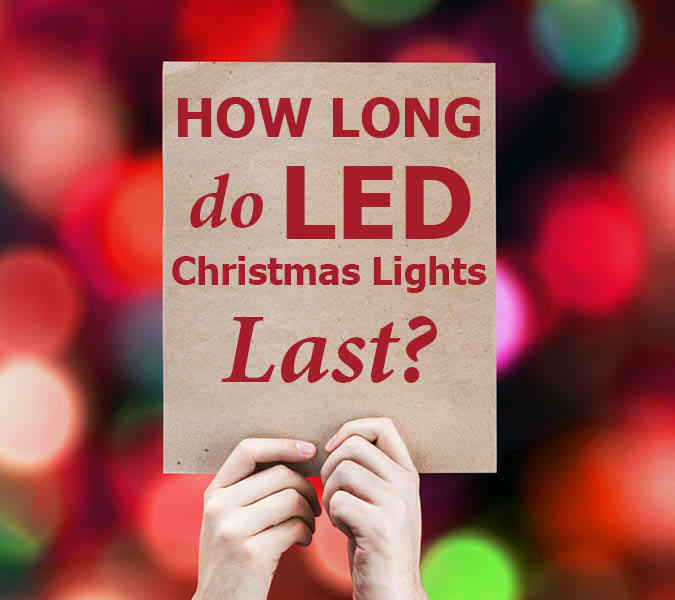 The answer to that question, according to our competitor's blog post, is that you can expect your LED Christmas lights to last for up to 20 years. Two decades! That's absolute nonsense. It's pure marketing hype. (And I could use much stronger terminology in conveying my opinion of that answer.) I can assure you that the next set of LED Christmas lights you purchase will NOT last you for 20 years. 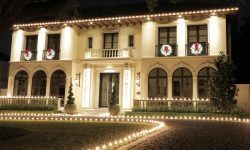 By now, I know that most everyone has heard of the many benefits of LED Christmas lighting. 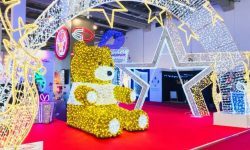 Though there's lots of hype swirled into that mix, that doesn't change the fact that LEDs really have been game changers for decorative Christmas lighting (and many other applications). Though we still offer incandescent lights to customers that want them, LEDs now comprise almost all of our sales. 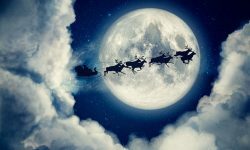 And we've long since switched to using LED lights exclusively in our own commercial Christmas lighting service - that's 60,000 sets installed every year. Our professional installers haven't strung a string of incandescents on a home, a business, or a city street in many years. That's because LEDs DO use far less electricity than incandescents. They DO provide brighter, sharper illumination than incandescents. They DO deliver colors that are purer and richer than incandescents. And yes, LED Christmas lights DO last longer than incandescents. If — just like some of the less honest Christmas light sellers out there — I were to tell you that the LED lights you buy from us will last you for up to 20 seasons, you'd be delighted with that answer. And then in some future season, when those lights started to fail way ahead of the promised timeline, you'd be disappointed. So here's an honest answer to the question: A string of top-quality, professional grade Christmas lights can reasonably be expected to last for roughly 6 or 7 seasons. That assumes that the lights are removed and stored during the off-season, and not left up year round. Leave them up all year and you can reduce the expected lifespan to the 2 to 2.5 year range. But keep in mind that if you live close to the ocean, you can expect to reduce the life of your light sets by up to 50%. If you buy LED lights that are of lesser quality — and particularly if you buy cheaper lights that are of a 2-piece design, where the bulb can be removed from the socket — you can expect a far shorter lifespan. It's not entirely unusual for a cheap string of LED lights to fail even to make it all the way through the first season of use. So good quality lights, used seasonally, can reasonably be projected to last for 6 or 7 seasons. Is the 20-Year Claim a Pure Lie? But a string of Christmas lights is comprised of much more than just the diodes; there are other components that are susceptible to failure. And while a diode might burn bright for 75,000 hours in a protected laboratory-like environment, that's not how Christmas lights are used. 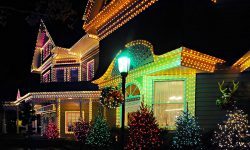 Christmas lights are roasted by the sun - UV exposure is the single largest cause of deterioration. They're battered by wind and rain. They're jostled and jiggled and bumped as they go through the cycle of installation, takedown, and storage each holiday season. They're sometimes stored in not-so-friendly environments, like scorching-hot attics. So though a light string may contain diodes capable of burning bright for 75,000 hours, that light string isn't going to last for nearly that long. Some of our competitors obviously believe that marketing hype is the key to success in this business. At Christmas Designers we believe just the opposite. We believe that telling you the honest truth about our products is the way to build a solid foundation for long-lasting, successful business. It's an approach that has served well, both our customers and ourselves, for nearly half a century…roughly the consecutive lifespan of 6 or 7 of our Pro Grade LED Christmas light sets!